Irish potatoes are not the most efficient crop we can grow in the vegetable garden. They take several months to reach maturity and have a lower rate of return than many other crops. They are not difficult to grow, but we do have to put in some effort to grow a quality crop. They are not an economical crop either. A pound of premium, organic seed potatoes can exceed the cost of the harvested crop when compared to market prices. So why do I still love growing Irish potatoes? A freshly dug potato is a completely different experience than a market potato. They have a earthy-sweet flavor and a naturally creamy texture. They have reached their optimal sugar-starch balance, which starts to change almost immediately after harvest. Many people have never eaten a freshly dug potato, and they are really missing something. They are impossible to find in a retail grocery store. You either have to know a grower or be a grower. Much of the published cultural information about growing potatoes just doesn’t work well for our area. A successful crop depends on choosing the right varieties and practicing a few cultural techniques. We are also limited in the types of potatoes we can grow, a fact most articles don’t address. Russet type baking potatoes that we find in the markets do not do well here. One exception is Russet Norkotah, a popular Florida variety. We can grow several red, white, or yellow varieties easily. White Kennebec, Red LaSoda, Norland, Red Norland, Dark Red Norland, Red Pontiac, Russian Banana Fingerling, and Yukon Gold are known to grow well here and are usually available at local independent nurseries. 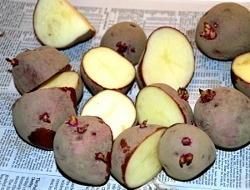 A new variety called Purple Majesty is growing in popularity because it is more nutritious than white potatoes. It should do well for us. One thing we must watch for is the days to maturity. Irish potatoes are a cool season crop for us. Long/late season potatoes will not produce well here, if they produce at all. Warm soils inhibit the formation of tubers, and long/late season potatoes will be forming tubers when our soils are beginning to warm. Potatoes, like their cousins tomatoes, come in determinate and indeterminate varieties. All of the varieties that do well here are determinates. If you want to experiment with other varieties, you will also need to stick with determinates. It is not always easy to find this information. I have never seen it displayed on a package of seed potatoes. The closest you can come is to select early to mid-season varieties; information which is readily available. This chart reflects locally available varieties. Before you try to grow potatoes in one of the bin, barrel, or tower systems you have seen advertised, please read our page on the topic here. There are such exaggerated reports about yield everywhere, and the numbers are all over the place! On average you can expect about 2# – 5# of production per eye or small seed potato planted. Most people report an average of between 5:1 to up to 10:1 (pounds of return per pounds planted). Some varieties may produce as much as 15:1. This will depend on a lot of variables. Keep this in mind when purchasing seed. If you are trying to provide all or most of your family’s needs, you will need to purchase sufficient seed. Many of us will not be able to devote that much garden space to potatoes. However, the flavor and nutritional difference of a freshly dug potato will tempt you to at least grow a few pounds as a table treat. In potatoes, “seed” is small, young potato tubers. It is best to buy fresh seed potatoes every year to prevent carrying diseases over from year to year. Nurseries and internet sources carry certified seed, and disease inspection is part of the certification. Do not buy market potatoes to plant out. They are usually not a good variety to grow here, they are generally treated to inhibit sprouting, and they are not certified as disease free. The age of the seed makes a difference. Young seed is that which has barely visible sprouts at the eyes or maybe one or two sprouts. Young seed will generally produce fewer, but larger tubers. Middle-aged seed is that which has multiple sprouts, but the sprouts do not appear “hairy”. It will generally produce more, but smaller tubers. I prefer smallish seed potatoes. I plant them whole if they are less than 1 1/2 to 2 oz. which is about the size of an egg. If the only seed available is larger than this, you will cut them before planting. 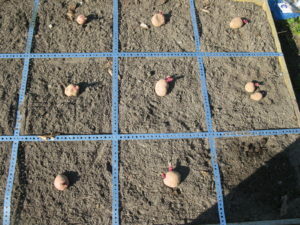 Seed potatoes need go through a period of dormancy before they will sprout. Certified seed has been through this resting period. Keep it in a warm place out of direct light until you are ready to plant. Sort your seed potatoes. All of them that are the size of an egg or less can be planted whole. Larger seeds can be cut into chunky pieces, each containing at least two eyes. After cutting them, lay them out on a paper towel with the cut ends up and allow them to dry for several days before planting. I sometimes dust them with a little corn meal before planting. It’s an inexpensive, handy anti-fungal. Potatoes like well-drained, compost rich soils. 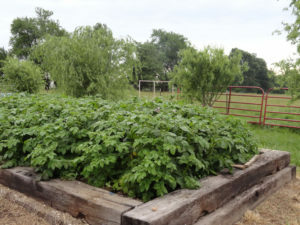 I grow potatoes in my square foot garden beds, which are filled with Nature’s Way Resources vegetable garden mix. I amend this with additional compost. The soil should be worked to a depth of at least 8″, but 12″ is better. A raised bed is perfect for potatoes. Potatoes need readily available fertilizer. I use 1/2 cup per square in my beds because I am using slow release organic fertilizers – Microlife, Arbor Gate Blend, or BioBoost. I also add a generous handful of dried molasses per square. I trowel this all in before planting. Potatoes benefit from the application of greensand and seaweed meal. Potatoes should be planted 6″ deep for the best results. Studies have shown that 6″ is optimum, 2″ reduced production, and 4″ was not significantly less productive than 6″. However, if you plant them 4″ deep or less, you will probably end up having to “hill” the potatoes. If you are a row planter, you can dig a trench and plant the seed 12″ – 15″ apart in the row. Wide row planters can plant on 12″ – 15″ centers, and square foot gardeners will plant their seed on 12″ centers. I use raised, square foot beds. They are 5 1/2″ deep above the native soil. We plant the seed directly on top of the soil in each square. Then we place a second box on top of this, which is 5 1/2″ deep. We fill the entire box with compost, all the way to the rim. They are mulched over this, which eliminates my need to “hill”. Most of the planting schemes for potatoes allow for periods of “hilling”, which I do not recommend for the varieties we can grow here. Hilling is a practice of pulling additional soil up around the stems of the vines every time they reach 8″ – 10″ tall, leaving only the top leaves exposed. The practice of hilling is intended to protect the developing tubers from exposure to the sun. 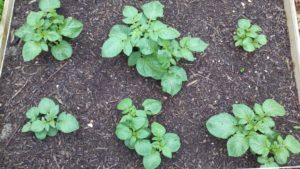 Direct sunlight can cause the potatoes to “green”. Greening is a sign that the potatoes have developed a glycoalkaloid that can cause digestive upset. Read more about potato greening here. Traditional deep and repeated hilling only benefits indeterminate varieties. Hilling too deeply can actually kill determinates. It usually results in the vines producing only a few, very tiny tubers. If hilling is practiced at all in our area, it should only be a sufficient depth to cover any exposed tubers. When the plants are 6″ – 8″ tall, side dress them with an additional dose of fertilizer. I generally broadcast about 1/4 cup per plant and lightly stir it into the soil with my hand. Avoid cultivating with tools so you don’t damage the roots or any tiny tubers that are developing. Potatoes are shallow. Keep the bed evenly moist, but it should never be water-logged. Swings in moisture lead to some common potato problems. Watch for any tubers that may be visible on or near the surface. Pull additional compost over any that are exposed. If you wish you can mulch with spoiled hay or pine straw to support the plants and prevent greening of shallow tubers. Tubers generally start to form when the plant starts blooming, but the plant does not have to bloom to produce tubers. Tubers are a modified stem, not the result of flowering. Flowering is just a good visual signal for us to start watching. About two weeks after flowering, you can GENTLY dig around the base of the plant and check for tubers. Some people will actually harvest a few that are the size of large marbles at this time for an early treat. Allow the majority to mature fully. The plants will begin to yellow and die. Allow them to die completely as this will help the skins set and toughen which will reduce damage during digging and extend storage life. In loose soils, many potatoes can be dug by hand. Potato tubers form relatively shallowly. Just start working around the stem and base of the dead plant. If you prefer, you can dig them with a spading fork. Just be sure to go slowly and gently to avoid damage. Do not leave the dug tubers in the sun. Move them to a shady location as soon as they are dug. Allow them to dry. Don’t brush them or wash them. After they dry completely most of the soil will fall off easily. Place them in an open basket and store them in a well ventilated room at household temperatures. Do not refrigerate – this can cause the starch to revert to sugar, affecting cooking and flavor. Potatoes can definitely be grown in large containers. The soil should be loose and compost rich. Plant one seed per 5-gallons of container size. ; 6″ deep. Fertilize with one of the three SROFs I mentioned above at one cup per 5-gallons of container size. Keep evenly moist, but never soggy, throughout the season. You can use 5-gallon buckets, large nursery containers, half barrels, or grow bags. Make sure your container has adequate drainage before you plant. Use the container method only in cool months – warm soil causes the tubers to stop forming and containers are more susceptible to warming. Irish potatoes are called “Irish” because they are associated with the Irish Potato Famine. In reality, Irish potatoes are from the Andes area of South America.